Saturday October 1st 1910 A fine day. I was busy all forenoon with baking and ironing Will went to town. We both went down in afternoon. I took some things to the M E rummage sale. I did not stay long. I did the mending and fixed things for dinner [illegible] Sunday October 2 1910 It was a nice day I was busy all forenoon getting the dinner. Rob & Cora with Blanche and Baby Robert came out at 11.30. We spent the afternoon in visiting and they went home at 4.30. 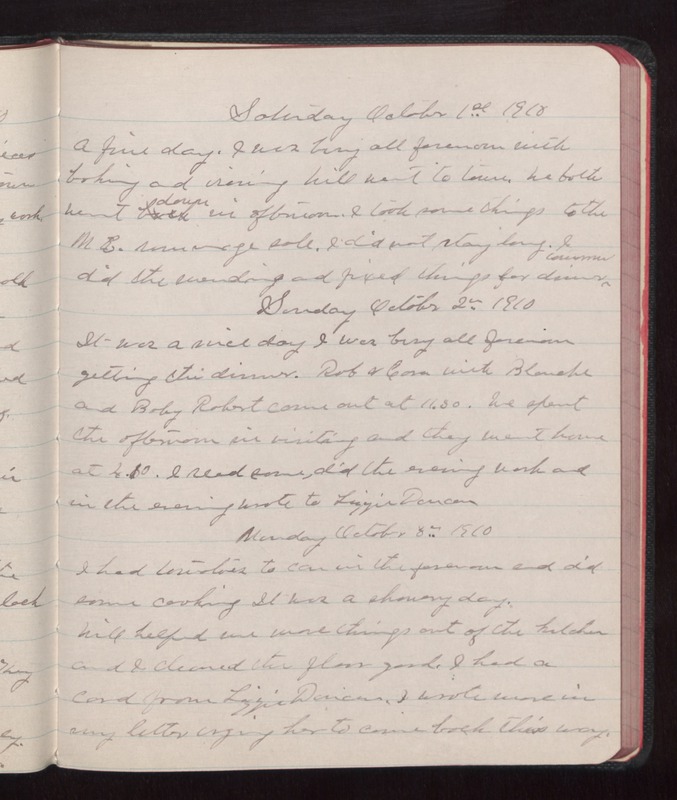 I read some, did the evening work and in the evening wrote to Lizzie Duncan Monday October 3 1910 I had [illegible] to can in the forenoon and did some cooking It was a showery day. Will helped me more things out of the kitchen and I cleaned the floor good. I had a card from Lizzie Duncan. I wrote more in my letter [illegible?] her to come back this way.